I love the matte finish of chalk paint. FolkArt Home Décor Chalk, from Plaid, is a no-prep acrylic paint and wax that dries in minutes and can be layered and sanded to give you the perfect distressed look and feel. You can transform your everyday items into one of a kind treasures. 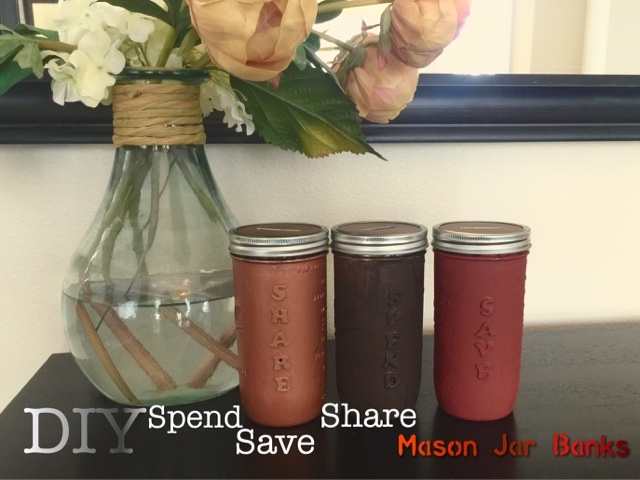 For this project I am creating Spend, Save, Share Moon Jar Banks using mason Jars. 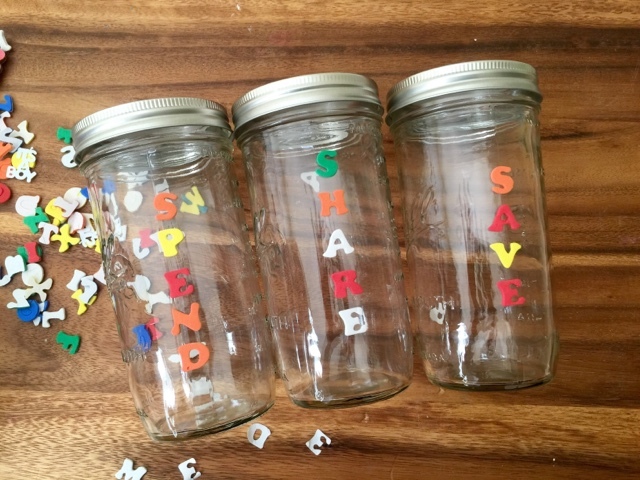 For those of you who aren't familiar with a "Moon Jar" it is basically a way to split your earnings and teach kids (or even adults) how to budget. The titles are pretty self explanatory, spend is the bank you put for money you will spend, save money you will put away, and share money that goes to charity. I wanted to make a more adult version of this bank for a teenage niece that is in college. I decided to use the FolkArt Home Décor Chalk paint because it is easy to use. Very forgiving and requires little or no surface preparation. I could paint on glass without any issues. I finished the top of the bank and the jars with Mod Podge Chalk Finish to protect the surface. 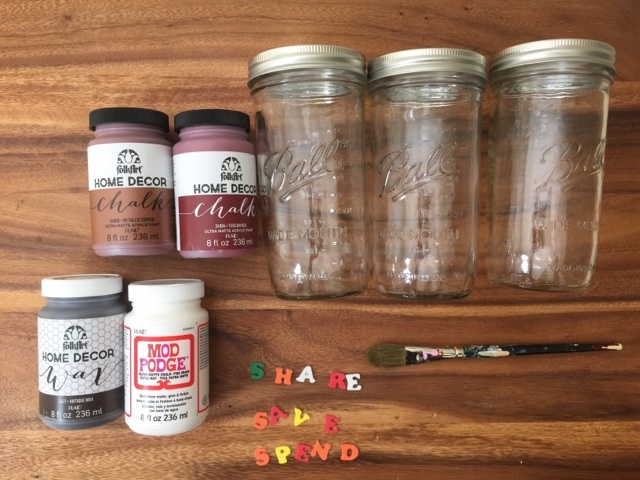 Materials needed: Folk Art Chalk Paint, Wax, Chalk Mod Podge, foamies letters, brush and mason jars. Stick foamies letters on jars. If jars are old, then be sure to clean the jars for good adherence. 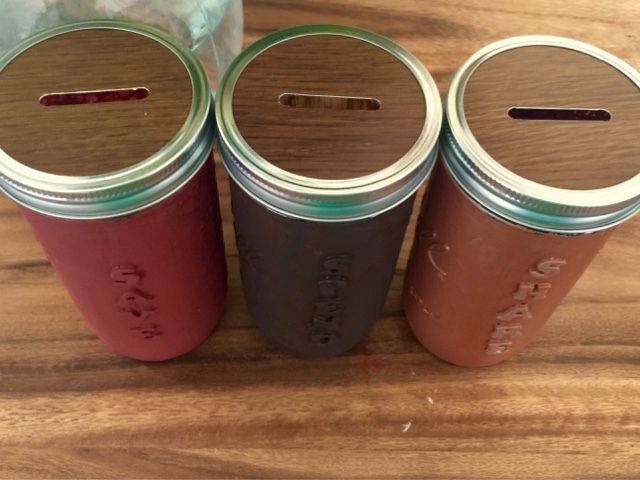 Paint jars with chalk paint, then cover with Folk Art Wax and then Mod Podge wax. Allow 2 hour drying between coats. I had my daughter paint this. I love this stuff because it is made in the USA and is very durable. 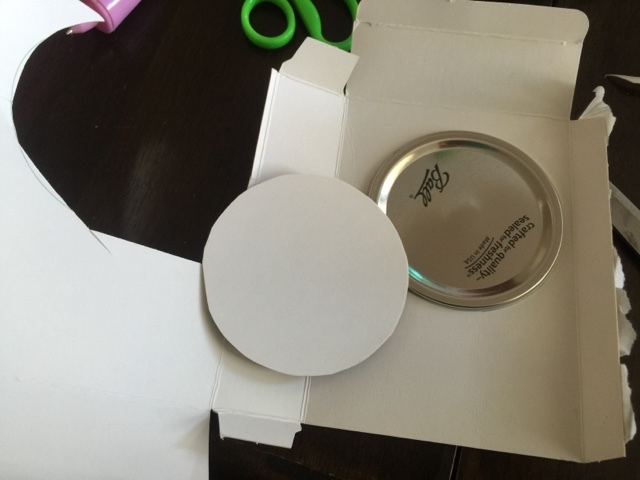 To make bank lids cut out cardboard in shape of mason jar lid. I covered with some wood scrapbooking paper. 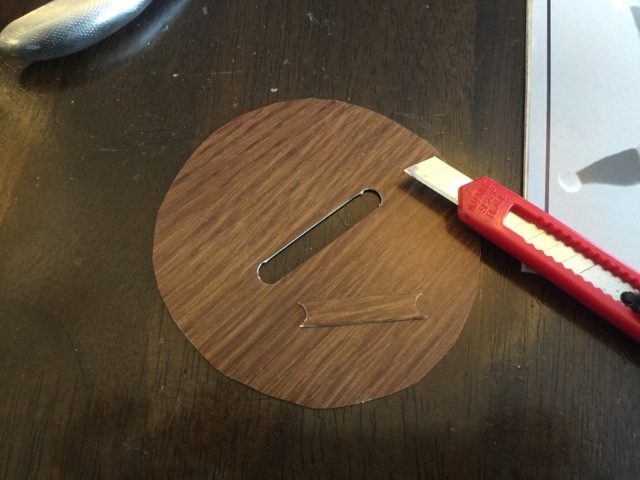 Punch two hold with a hole punch. 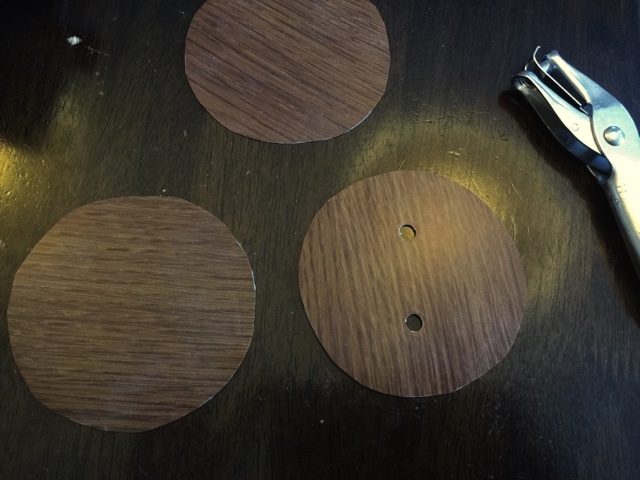 Connect the holes to make a slit. Paint over with Mod Podge to protect. 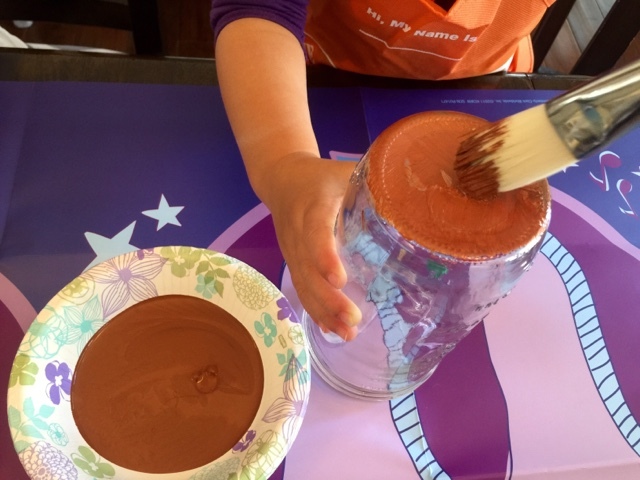 Wait for jars to dry (2 hours) add additional coat, wait to dry and then cover with wax or Mod Podge chalk finish. Perfect little banks to teach a little financial responsibility. Be sure to check out Plaid Crafts on all their social media sites. Wow, these jars looks awesome now. Great work. Keep it up and thanks for sharing. Let’s keep the best falsh games for your child! abc | slither io | pokemon go | wings io | happy wheels : are safe place to play the very best free games for kids! 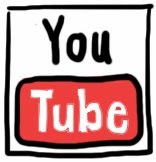 Great blog, I like your ideas and art, Its helping to making good mark. Amazing post, very much useful information. 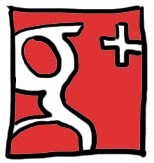 I found your blog a few days ago from Google and I reading this post it is really nice days. Thank you for sharing this article, I am glad that I have read your well written and very exciting post! Its looking so pretty and useful stuff, Thanks for share share that. That good idea. I like your post. It really useful with me. Thanks for sharing these useful information! Great post I visit your post here is good information for us thanks for sharing with us. Surely there will be more people waiting to read your next article. Wish you more and more writing every day. Thanks for your information. It is very necessary for us. I still liked this article, good, good content, and unique design. Rubber Mouse Pad, professional Internet cafes computer game mouse pad, large rough surface of the special focus on the big thick edge. Variety of options can also choose to choose thick, all the lock side. if anyone face any kind of problems related to lenovo product then visit our site our team resolve your problem easily and you feel happy while visiting.